The warrior Celts (c.600BC—AD50) were famed for their ferociousness and tenacity in battle, and even received grudging respect from their Roman adversaries. 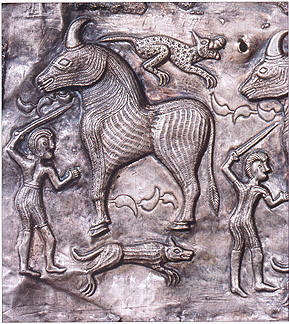 The early Celts fought mainly on foot (later in chariots and on horseback), and relied heavily on the awesome psychological and physical impact of a massed charge of their warriors. Armed with either sword or spear and protected with little more than a shield or helmet, they defeated the mighty Roman legions and, in 390Bc, even sacked Rome itself. The Celtic sword symbolized to its owner power, strength, honour and ultimate glory in battle. The fine quality and extraordinary skills required to produce these swords meant that they were extremely expensive and normally reserved for nobles and chieftains. The sword was often buried with its owner amongst his many other possessions, or symbolically thrown into water as a gift to the gods or spirits. With a large inwardly curving, single-edged blade rather like a kukri (heavy, curved Nepalese knife), the falcata was an extremely devastating weapon. Hilts were iron, hook-shaped and sometimes decorated with stylized horse or bird-head pommels. The origin of the falcata was pre-Roman and it is likely to have been a development of the ancient Greek sickle-shaped sword, or kopis. The sword could deliver a very powerful blow, something akin to an axe strike but with the slashing capabilities of a conventional sword. Contemporary Roman writers often describe how the falcata had the capacity to split both shield and helmet. The Celts of Hispania (Spain) were said to be the most feared exponents of this sword and it was a common weapon encountered by Roman forces during the early years of the Roman Republic (509—l24BC). ABOVE: Relief plaque, made from copper with silver and gold plating, of a warrior wielding a long-bladed Celtic sword from the 1st century AD. During this possibly unique process of manufacture, various forged steel plates were buried in the ground, usually for more than three years, and allowed to corrode. They would then be dug up and any weak or spurious metal would be separated and discarded. Any remaining good steel was reforged again through the traditional Celtic method of pattern welding — the practice of forming a blade from several metal pieces of differing composition. The blades were then forge-welded together and manipulated to form a pattern, making it considerably harder. In response to these much tougher blades, the Roman legions redesigned their shields and armour to give them more protection. The introduction of the Roman gladius, or short sword, was said to be a direct reaction to the Roman soldiers’ battlefield experience of the falcata. The growing use of cavalry and, later, the war chariot meant that Celtic warriors needed a longer sword to effectively reach down and strike at an opponent. These long swords, with an average blade length of around 70cm (27.5in), had wood, bone or horn hilts, with blades manufactured in iron or steel. Scabbards were normally constructed from plates of iron and suspended from a belt of iron links. (c.AD46—127), but it seems more likely that this was Roman propaganda, as subsequent archaeological testing of excavated Celtic sword blades indicates that the quality of the iron and steel was quite exceptional. Archaeological finds from the La Tène settlement on the north edge of Lake Neuchâtel in Switzerland, dating to around 500—1 BC, highlight the Celtic genius for creating swords with complex abstract and organic decoration on both the hilt and the scabbard. Blades were double-edged and straight, and made from pattern-welded iron or steel. They are found in both long and short versions. Many finely worked hilts also feature human heads and other anthropomorphic and zoomorphic motifs. RIGHT A 1st or 2nd century ec sword and scabbard from La Tène in Switzerland. A standard battlefield weapon for the Celtic warrior, the Celtic spear or javelin normally comprised an ash wood pole around 2m (6.5ft) in length, fitted with a large iron, leaf-shaped and socketed spearhead. Following military experience gained after initial contact with the Roman armies from the 1st century AD, the Celts changed the design of their spearheads so that they possessed a narrower profile. This was a reaction to the Roman use of protective body armour and the need to find a spear that could effectively puncture their plate. Spears and javelins were also carried in bunches by young warriors, or “gaesatae”. These were paid mercenaries who had gained a fearsome reputation for their bravery. Once they had thrown all the spears at the enemy, they would retrieve them from the ground or their opponents’ bodies. Right: Three Celtic spearheads from the La Tène period, each with a leaf-shaped, finely ridged, slightly bent blade. Two of the examples have holes in the socket for attaching the head to the shaft.